Don't get it wrong by not registering. 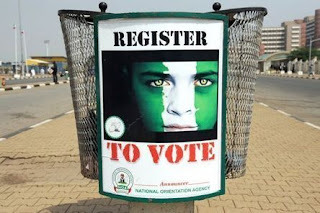 Brave the odds, register to vote in the upcoming general elections. We all build our nation by getting involved. Voting is your right and accorded privilege, not to vote is to lose your right, your voice and your freedom. Do not allow circumstances, situations and “I don’t care attitude” to rub you of your fundamental existence as a (Nigerian) and as a human being. Finally I got registered to vote at the dying minutes on Saturday. Praise the LORD! I can tell you that I have a great son in law...I am truly blessed...He queued up & took the stress off me. Nigeria go survive!